High Street Chain Breakfasts: How Unhealthy Can They Be? Where I grew up in Liverpool in the early 1980s, breakfast was almost unanimously a home-prepared meal. Consequently, if you didn’t eat breakfast at home, aside from a scattering of greasy spoons and butty bars, there really weren’t many options available to you; a bowl of Ready Brek or a couple of poached eggs were among the most convenient means of embarking on the day with a decent store of energy. As we know, matters have fundamentally changed over the past 30 years. The restaurant industry in the UK has boomed during this time. There are now countless food outlets that offer breakfast on our high streets, as well as in our shopping malls and motorway service stations: meaning those who leave the house in the morning having not eaten already are spoilt for choice. This development is undoubtedly advantageous for those with a busy lifestyle seeking convenience. But how beneficial is it for our health? This week, we set out to investigate the breakfast choices on offer at several popular UK chains. Moreover, we wanted to explore how easy it might be for consumers to approach and even exceed daily reference intake amounts through just one meal. Surprisingly, many prominent brands still do not list the nutritional values of their food on their websites; which puts consumers at a disadvantage. We would therefore like to praise the 11 brands we have featured for making their nutritional information available and easy to access. Transparency with consumers when it comes to nutrition is vital; and in this respect, the 11 chains below seem to be leading the way. We noticed that what the chains interpret as ‘breakfast items’ varied significantly. For instance, McDonald’s and Burger King consider muffins (the sweet kind) to be breakfast items and include them on their breakfast menus. However several of the other chains, including Starbucks, Caffe Nero and Costa Coffee did not. This was also the case with croissant items. Some chains included them on the breakfast menu but others didn’t. Caffe Nero doesn’t have a ‘breakfast menu’ on the nutritional information page of their website per se (instead categorising their items into ‘Panini and Sandwiches’ and ‘Pastries and Muffins’) but is open for trading at breakfast time and sells breakfast items. Where no breakfast menu was available, in addition to considering the above, we also considered any items with the word ‘breakfast’ in the title. 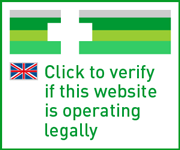 All data was accessed on the websites of the chains, and was correct as of 7/9/2016. Where possible, we referred to nutritional information pdf documents held on the websites. Where these weren’t held, we referred to the interactive sections of the menu on the chain website. The Wetherspoons Large breakfast tops the list with 1531 calories. That’s three quarters of a woman’s daily reference intake (2,000) and just over 60 percent of a man’s (2,500). Harvester’s Ultimate Breakfast Bap is in second, with 1307 calories. In a somewhat distant (but still calorific) third is Wimpy, with their 900 calorie All day breakfast. * Because it wasn’t available in all locations at the time of research, we omitted Burger’s King’s breakfast platter from consideration. 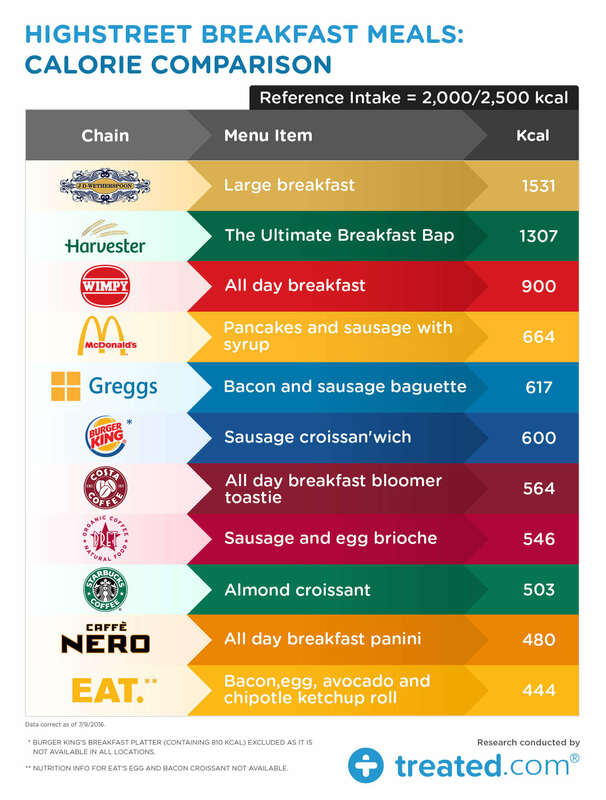 The most calorific breakfast options on offer at what we might perceive as ‘higher end’ outlets such as Costa and Pret a Manger are closer in calorie value than many might suspect to those available at McDonald’s and Burger King. 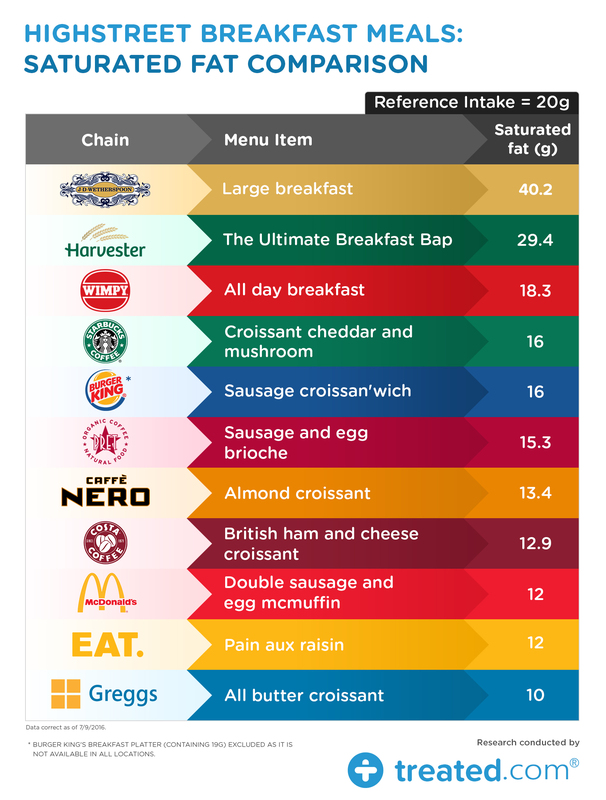 In fact there’s less than 120 calories between 4th placed McDonald’s item and 8th placed Pret a Manger’s item, with Greggs, Burger King and Costa in between. Wetherspoons Large breakfast is top again, containing an almost unbelievable 18.3 grams of salt. We're tempted to speculate that an error has been made somewhere in the compilation of their new nutritional information (released in the last couple of weeks), just because this is such a huge figure. If the 18.3 figure is accurate, it means that the dish contains over three times an adult’s reference intake (2-6 grams). Harvester’s Recommends cooked breakfast also exceeds the daily reference intake at 7.4. Those who consume too much salt on a regular basis are at increased risk of high blood pressure, which can in turn lead to heart disease and stroke. Harvester’s Belgian waffles dish with all the trimmings tops the list, with 77.4 grams of sugar. Wetherspoons clocks in at second with its MOMA! Porridge with banana and honey. The recommended daily intake of total sugars for an adult is 90 grams. However, as we’ve discussed previously, there’s a difference between recommended total sugars and added sugars intake. Health guidelines state that foods with added sugar should actually make up no more than five percent of a person’s daily calorie intake. 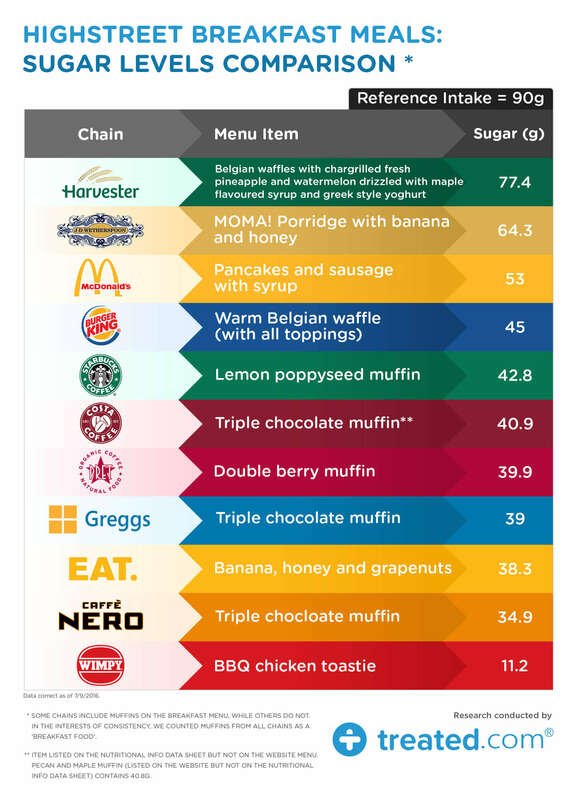 So in truth, even someone consuming Caffe Nero’s 10th placed Triple chocolate muffin for breakfast, which contains 34.9 grams, could still feasibly be very close to approaching (if not exceeding) their recommended daily ‘added sugar’ intake. Wetherspoons Large breakfast tops the list, with 40.2 grams of saturated fat; double the healthy reference intake for an adult (20 grams). Harvester comes in at second, with Wimpy’s All day breakfast coming in at third. Although they rank from 4th place onwards, five of the 11 dishes featured are croissants, no doubt due to the amount of butter used in their preparation. However many may be surprised to learn that croissants can contain more saturated fat than those traditional breakfast dishes we might often see as being more fatty, such as the bacon sandwich. 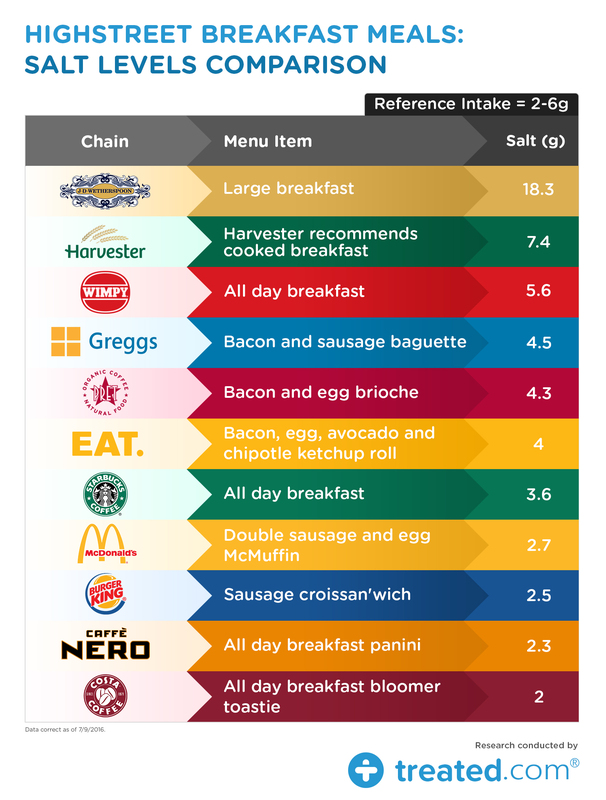 In the interests of balance, we would like to point out that these chains do offer breakfast options which are significantly healthier than those listed above. Harvester’s ‘Avocado Brunch and Tomato Salsa served poached eggs on toasted muffin’ is a nutritious breakfast offering containing 421 calories and 1.6 grams of salt. They also offer a range of healthy items on their breakfast buffet. Fresh fruit is also available on the breakfast menu at Wetherspoons. Their Smoked salmon, cream cheese and rocket bagel only contains 410 calories and 0.8 grams of salt. Wimpy’s scrambled egg on toast contains 292 calories and 0.9 grams of salt. And there are countless options that are considerably lower in calories, salt, sugar and saturated fat available at the other eight chains featured, as well as fresh fruit available too. According to a HSCIC report obesity rates in the UK have risen from 15 percent to 26 percent between 1993 and 2014. 58 percent of women and 65 percent of men surveyed by the report in 2014 were either overweight or obese. Some of the health risks closely associated with obesity are diabetes and cardiovascular disease. and easier access to sugar- or calorie-dense foods. These final two points, access and convenience, arguably come into play more so with breakfast than they do with any other meal. Many of us will have less spare time in the morning than we do at any other point in the day, and as a result breakfast can often be the meal we’ll either skip altogether, or turn to a popular food outlet for. Clearly the environment where we have the most control over the food we eat is in our home kitchen, when we prepare the meal ourselves from scratch. When we make breakfast at home, we can control the amount of salt, cooking fat and sugar we add, whereas when we eat out, we can’t. So it stands to reason that the healthiest option is to get up early and put the time in preparing our own breakfast. Eggs, fruit, natural yoghurt, salmon, porridge, nuts and high fibre cereal are all examples of breakfast components which can form an essential part of a healthy diet. Buying these items in advance and getting up 30 minutes earlier to prepare them may not be as convenient as eating breakfast out; but it is cheaper, and reduces the likelihood of succumbing to a less healthy option in a chain restaurant. Can eating at chains be healthy? Provided you’re careful with your choices, yes. The less healthy breakfast dishes we’ve explored above are intended to be at most a one-off or occasional treat, and certainly aren’t intended to be consumed regularly. That said, provided you’re disciplined and consistently choose healthy options, frequenting chain outlets for breakfast can be a healthy (if more costly) alternative to preparing breakfast at home. However the more you make a habit of eating the same thing at a chain on a regular basis, the less often you’ll be trying new things and varying your diet to get all the nutrients and vitamins you need. For this reason, we would suggest that it’s ultimately more beneficial to eat breakfast out in moderation; to prepare your own food at home wherever possible, utilising a range of fresh produce, and only rely on eating breakfast out as an occasional treat.